OOTD + Daniel Wellington Promo Code | La Petite Noob | A Toronto-Based Fashion and Lifestyle Blog. I've said it more than once, but if there's a fashion rule book then I never received my copy. Wearing white after labour day - well why not! I like to get the absolute most out of my wardrobe and part of that is eliminating season-specific pieces. I love the juxtaposition of this eyelid white midi skirt with a black bomber jacket, black Daniel Wellington watch and a touch of leopard. To me, as long as white is grounded with darker neutrals you can definitely wear it all year round! You guys know that I'm a huge fan of Daniel Wellington watches. I love how timeless and classy they are, how versatile the interchangeable leather straps are and how it actually fits my petite wrist perfectly. This year I'm planning on gifting my family their own Daniel Wellington watches, and you can too - use code LAPETITENOOB for 15% off your order until January 15, 2016. What do you guys think? Do you like wearing white after Labour Day, or do you think that some rules are meant to be followed? I also love wearing white all year long. I love the way that skirt contrasts with the rest of your outfit and those heels are to die for! Thank you Helen! I just scored these leopard pumps at Winners (the Canadian equivalent to Marshalls) and haven't taken them off since! Totally fell in love with this outfit when I saw it on Instagram. 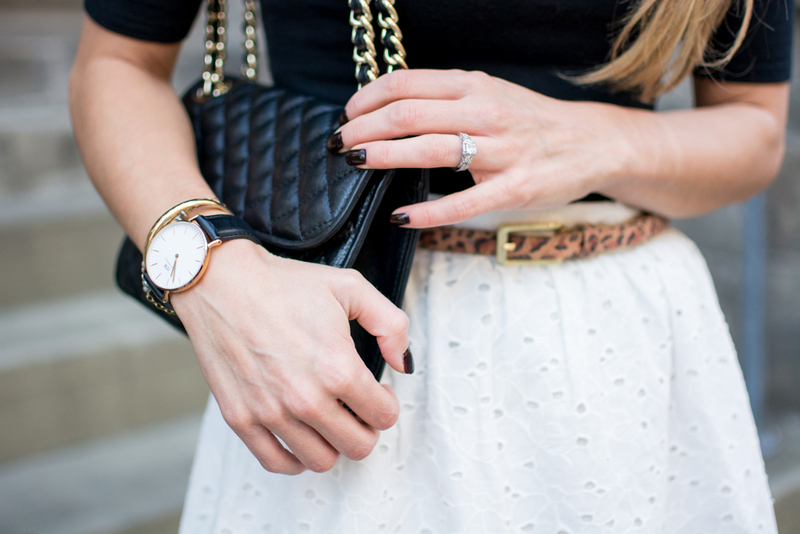 Love the Daniel Wellington watch, it adds such an elegant touch.